FIRST IN A NEW SERIES! 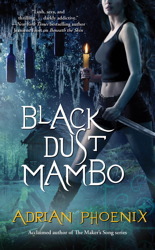 Kallie Rivière, a fiery Cajun hoodoo apprentice with a talent for trouble, finds herself smack-dab in the middle of one of those times her mentor warned her about when she visits New Orleans to attend the Hecatean Alliance’s annual carnival: her hard-bodied conjurer hookup ends up dead in her blood-drenched bed. And he was killed by something that Kallie would never dream of touching—the darkest of dark juju, soul-eating juju—a black dust hex that may have been meant to kill her.